Defending champion Olympiacos Piraeus rallied from a 15-point third-quarter deficit to remain undefeated after beating Montepaschi Siena 78-73 at Peace and Friendship Stadium. The Italian champs, despite missing star guard Daniel Hackett, led for most of the night, but the Reds outscored Siena 12-1 over the final two-and-half minutes to score a tough victory. Olympiacos, which had already clinched first place in Group C, improved to 9-0 by winning their 12th straight game dating back to last season. Montepaschi dropped to 3-6 and saw its Top 16 chances suffer a blow. 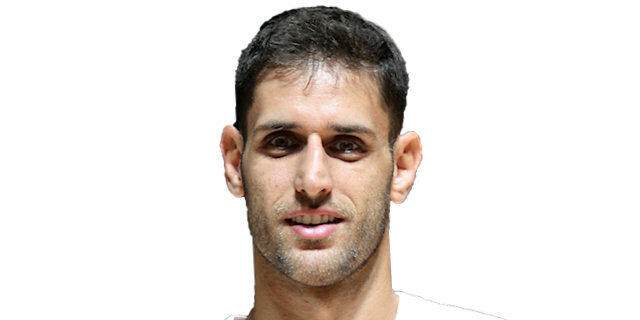 Stratos Perperoglou paced Olympiacos with 18 points on 4-of-5 three-point shooting, while Vassilis Spanoulis added 16 points and Matt Lojeski 10 – including 2 free throws with 11 seconds remaining to ice the win. 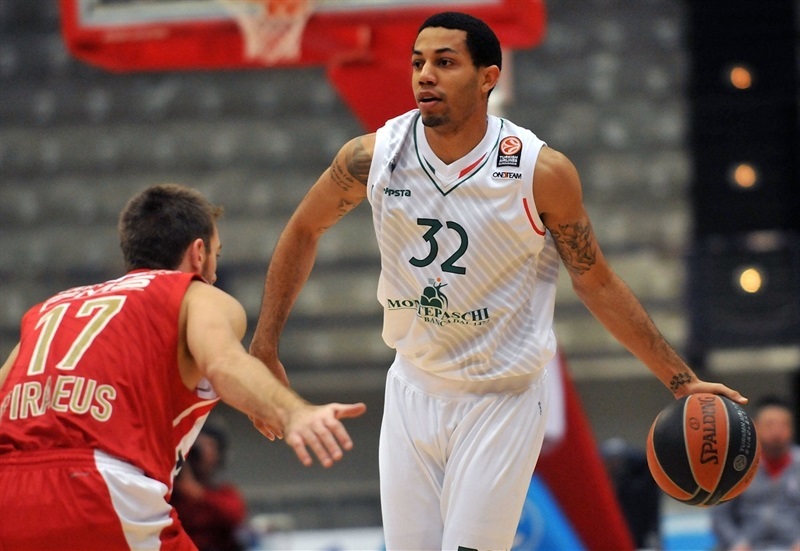 Erick Green paced Montepaschi with a career-high 28 points. Tomas Ress and Josh Carter each scored 10 in defeat. David Cournooh made his first career start for Siena, which gained the early momentum. An Othello Hunter jumper followed by layups by Cournooh and Green made it 0-6 after two minutes. 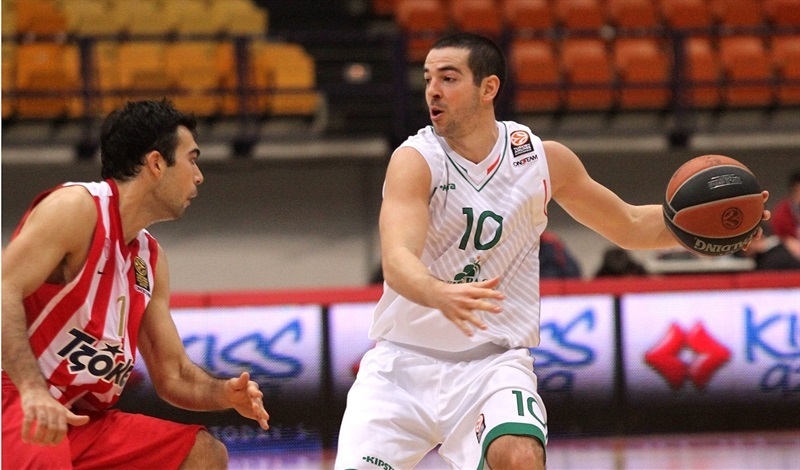 Vangelos Mantzaris provided the hosts’ first points with a three-pointer. Ress made a major impact with a rejection of Matt Lojeski on the break and a long jumper. Vassilis Spanoulis and Green traded free throws. Brent Pettway tried to ignite the home side with a fake three and drive for a monster slam to make it 9-11. Then Bryant Dunston and Pettway recorded blocks on successive defensive stands. Jeff Viggiano assisted Spencer Nelson as the visitors remained in front. After a Dunston put-back, Spanoulis brought the hosts within 1. Josh Carter sank a long jumper. Kostas Sloukas dished to Dunston for a basket inside to tie the game at 15-15, but Carter’s buzzer beater left the Italian champs up 15-17 after 10 minutes. Viggiano drove for a lefty layup, but Pettway was about to take over. The forward sank a three and then took a lob from Sloukas and threw down a two-handed alley-oop jam to give the Reds their first lead, 20-19. Lojeski followed with a jumper. Nelson free throws and a triple just before the shot-clock horn sounded lifted Siena in from 22-24. Nelson added another basket on the offensive glass. Acie Law split free throws twice over three possessions. 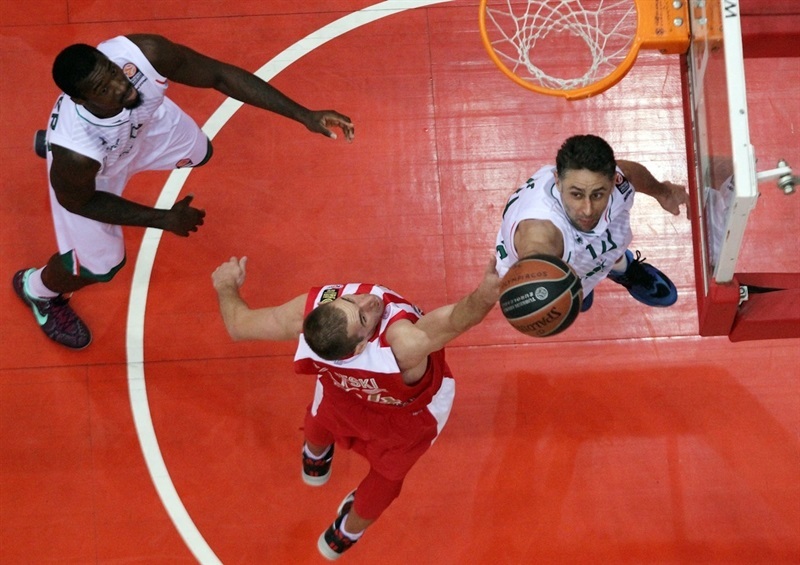 Green remained an offensive force and put the Italian champs up 25-30. Carter took the baton from Green and scored 4 straight points. Then Green drilled a jumper to make it 25-36 at the break. Dunston and Ress traded baskets in the first two minutes of the half. A three by Green put Siena up by 12. Spanoulis scored, but was quickly matched by Cournooh. Spanoulis set up Pettway inside, but Ress sank another jumper. Then Viggiano took a steal in for a slam and a 33-47 lead. 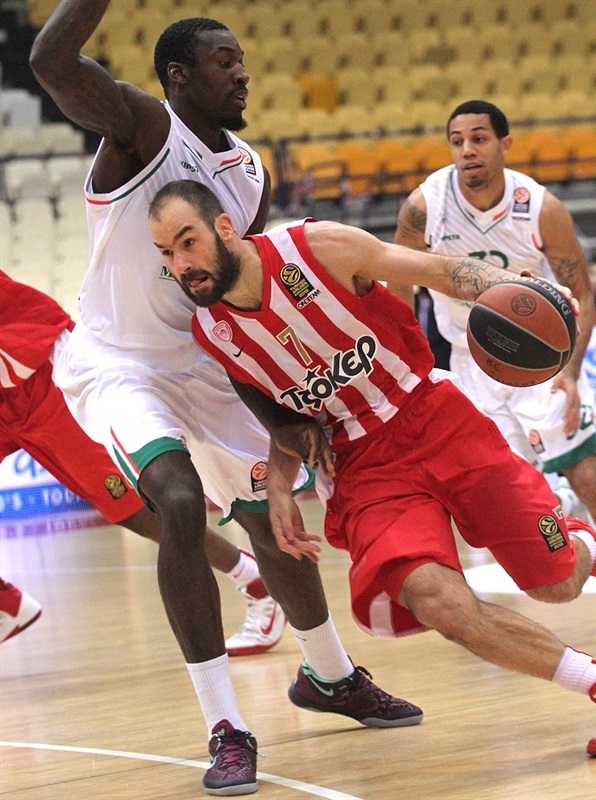 Olympiacos missed a chance to close the gap when Sloukas and Dunston both split free throws. Hunter rocked the rim with a slam on the offensive glass. Sloukas got back to the line and made 2, but Nelson bettered him with a basket-plus-foul to make it 37-52. Perperoglou sank a three for his first points. The Law got to the line again and closed the difference to 10. Green answered with his second three of the game. Sloukas drove for a layup Perperoglou took a steal in for a layup. However Green beat the third-quarter buzzer with a long, fade-away jumper to give Siena a 46-57 lead. Sloukas and Taylor Rochestie traded baskets to start the quarter. Perperoglou and Green then traded triples. Green followed with a mid-range jumper to make it 51-64. Perperoglou remained the lead force for the Reds and scored twice inside. Spanoulis came in and buried a three to bring the hosts within 6. Carter provided a highlight by soaring for a rebound and slamming it in with two hands. 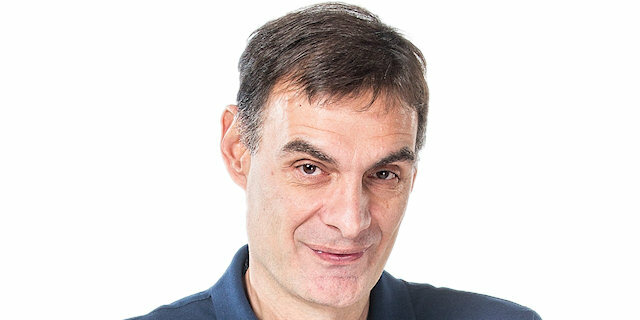 Perperoglou connected from downtown to make it 61-66. Green came to the rescue with a layup and then a jumper to restore a safer 9-point lead with four minutes remaining. Law scored and was fouled, but missed the resulting free throws. 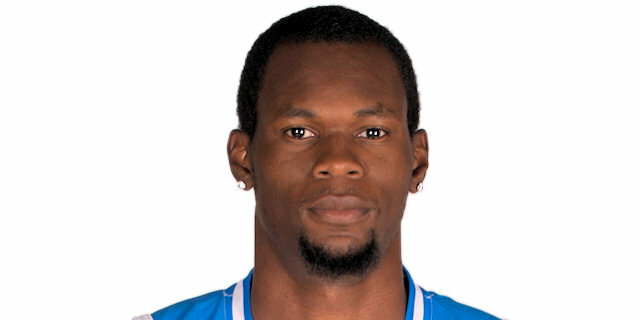 However Olympiacos got a break when Carter was called for an unsportsmanlike foul in stopping Dunston. Lojeski came in and made the free throws. Spanoulis drew a foul on the resulting possession and made it 66-70 with three minutes left. Hunter countered with a foul line jumper; Spanoulis drove for an uncontested layup. Perperoglou’s fourth three-pointer trimmed the deficit to a single point with a minute-and-a-half to go. Siena turned to Green, who got to the line and split free throws, 71-73. The clock showed 56.2 seconds when Spanoulis’s three hit the bottom of the net to give the hosts their first lead of the second half. Dunston broke up a pass from Rochestie and Lojeski swished a baseline jumper for a 76-73 lead. 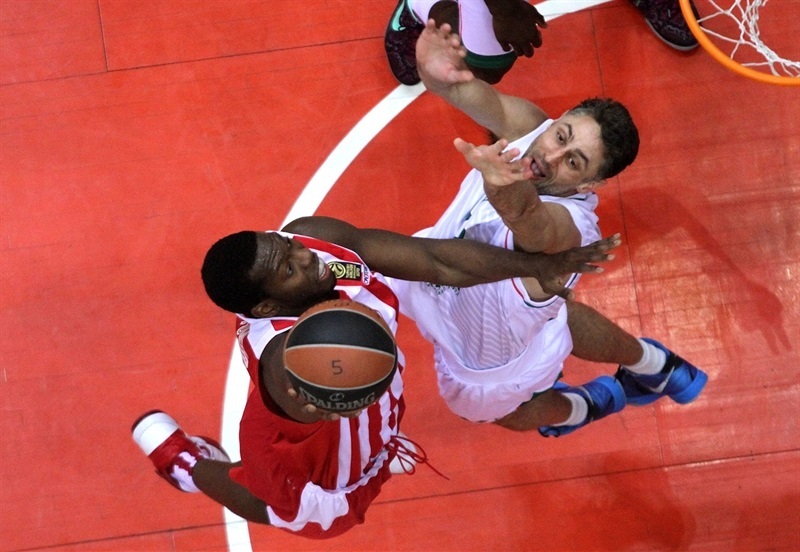 Olympiacos chose to send Viggiano to the line rather than risk a three-pointer. He missed the first – and then the second on purpose. Lojeski free throws with 11 seconds left iced the game. "I am satisfied with our performance here. Although we didn’t have Daniel Hackett, we played a high-level game for 35 minutes against the reigning Euroleague champions. It is all about a great game played by a small team and a unique victory achieved by a great team. As a coach, I repeat I am satisfied, but as a person I feel very sorry for my players because they missed the opportunity to win. For Olympiacos those comebacks are business as usual, because they built a huge confidence and they trust themselves. The comeback they made in the Euroleague final was an historic one, today they just did a regular job. It was not easy to play without Hackett, but I like to make combinations with different players in order to reach the target. Regarding the rumors about our financial problems, the club issued an official statement which I can’t comment on. The only thing I can say is that all the people who are involved in the team are satisfied with the situation, at least on the court." "We tried to play good defense but they made all the big shots and our reaction was very slow. Then we improved our game, played team basketball and got the win. We weren’t affected with the absence of our fans, it is something we have already experienced. The consecutive comebacks of the team are something unbelievable. I have no explanation, it just shows the character of the team. 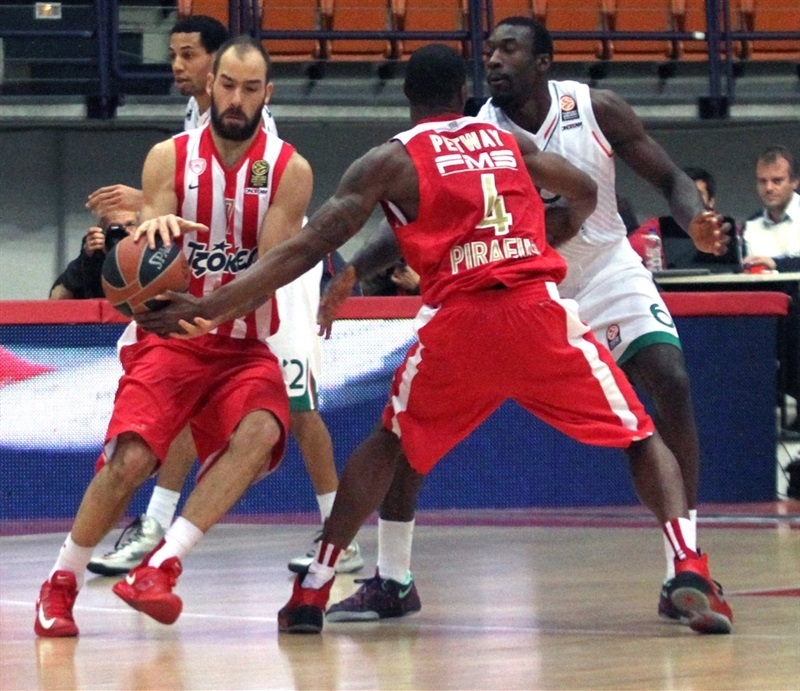 We have big leaders, like Spanoulis, and we never give up." "We didn’t start the game the proper way, and due to the low shooting percentage Montepaschi Siena took the lead. We came back, as usually, in the last quarter and managed to get a victory. However, we have to understand that it is not possible to win all games in this way. It is a big mistake to believe that we will beat any opponent playing bad, and coming back from deficits throughout the season. We would have lost tonight if we had to face a more competitive opponent. Regarding myself, I feel good here. It is my second season with Olympiacos and I am always ready to help my team. Tonight it was a little strange, because I was forced to spend most of the time playing at power forward."